Multi-function: digging, sawing, chopping, cutting, picking, prying, hammering, bottle opening, shoveling. Material: high-carbon steel body and steel handle, Total unfold length: approx. 430mm. Shovel Face Thickness: 1.5mm. 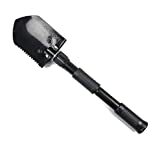 Made of strong tempered forged steel, the shovel measures 17″ (43cm) long when unfolded, include a serrated on one side of the blade so it can be used to saw off lightweight branches. The Folding shovel can be used to dig tires out of dirt if a car becomes stuck. These tools also make mini snow shovels for digging tires out of snow banks. It include a pick tool that can help crack ice or remove rocks. Since it\’s so compact and space-saving in design, a folding shovel is a great tool to have in any vehicle. The shovel can even be used to build sandcastles complete with trenches during trips to the beach. Total unfold length: approx. 430mm.